Imagine that one day a skilled mountain climber reads an article about a new mountain peak that had been conquered. The author of the article says that in all his years of climbing, he had never seen a view as beautiful as the one from the summit of this new mountain. The author goes on to say that it was the most difficult climb he had ever made, but that the reward far outweigh the effort. In response to the article, the reader thinks, "I must see this view. I will begin planning my climb immediately." It takes the climber some time to pull together all the resources he needs to make the journey. He even manages to persuade a climbing buddy to make the trip with him. Six months later, the climber and his buddy arrive at their destination. Within a few days, the man's climbing buddy becomes ill and is unable to make the final ascent to the mountain's peak. Leaving his buddy behind, the climber sets out alone. He tells his buddy that he will keep in daily radio contact with him and report back on his progress. When the climber radios in his first report he says, "I had a great day, and although the climb was slow and difficult, I climbed eight hundred feet up the slope." The next day the climber radios in and reports that the climb was slow and difficult, but that he had climbed another thousand feet. One the third day the climber radios his buddy and says, "The climb is still difficult, but today was my best day. I climbed five hundred feet." How can you consider today to be your best day on the mountain if you have climbed less than you did on the other two days?" The climber replies, "I didn't mean that this is my best day in comparison to how far I climbed on the other two days. This is my best day because I am now five hundred feet closer than I've ever been before to reaching the summit, and seeing that glorious view." The apostle Paul was remarkable man with an amazing focus on where he was and where he was going. There was nothing Paul faced that prevented him from daily moving onward toward his heavenly calling in Christ. Problems didn't deter him, trials didn't discourage him, persecution didn't defeat him, and hardships didn't weigh him down. Paul wasn't looking back, turning back, or going back to anything in his past. He didn't sit around counting the miles he had traveled or the distance he had come, but he pressed forward with his eyes on the summit of God's call and the glorious view of the heavenly things that awaited him. 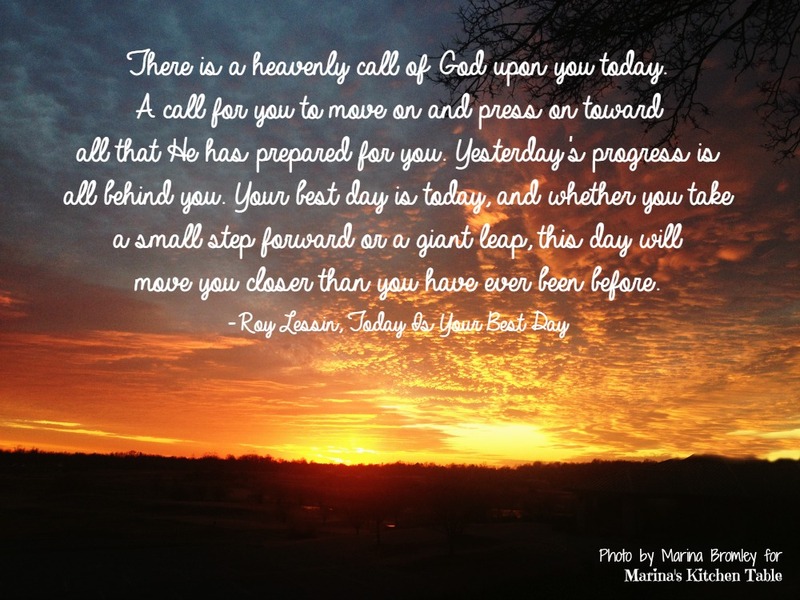 There is a heavenly call of God upon you today. A call for you to move on and press on toward all that He has prepared for you. Yesterday's progress is all behind you. Your best day is today, and whether you take a small step forward or a giant leap, this day will move you closer than you have ever been before.